Gift of Mr. Peter Dechert, 1975 (1975:9); and Mrs. Robert Dechert, 1977 (1977:7, 1977:33), 1979 (1979:56). Additional material is mentioned in the control file. The collection is organized into two Series: Robert Dechert, and Family Manuscripts. Both series have been arranged alphabetically. The Dechert family was involved in Philadelphia’s legal, civic, and military history from the mid-Nineteenth Century through Twentieth Century. Elijah Dechert (1799-1854) a prominent lawyer in Reading, Pennsylvania, moved his family to Philadelphia in 1852 where his wife Mary Porter had family connections stretching back to Andrew Porter. Their two sons, Henry Martyn Dechert (1832 – 1918) and Robert Porter Dechert (1842-1894), both become prominent lawyers in the city. Henry Martyn graduated from Yale University in 1850, and after two years as a school teacher he began his study of law in his father’s practice. In Philadelphia he continued his legal studies under Charles B. Penrose, and was admitted to the Bar in 1854. Henry Martyn would rise to prominence in his profession running a very successful practice and would become the first president of the Commonwealth Title, Insurance and Trust Company in 1886. Robert Porter was educated in Philadelphia, and began his study of law in 1861 in his brother’s firm. Both brothers volunteered for service in the Civil War. Henry Martyn helped organize the West Philadelphia Home Guard in 1861, and later volunteered for active service in 1862-1863 as a lieutenant. Robert Porter initially enlisted for service, but was quickly commissioned as an officer rising in rank to brevet Lieutenant Colonel by the end of the War. He saw service in the Eastern Theater as well as during the Carolinas Campaign in 1865. After the war he was admitted to the bar and was appointed assistant district attorney for Philadelphia in 1868. In 1870 Robert Porter was elected to the Pennsylvania State Senate, the start of an active political career. He continued his military service in the Pennsylvania National Guard, being elected colonel of the Second Regiment in 1878, and then promoted to general in command of the First Brigade in 1890. While Robert Porter remained a bachelor his entire life, Henry Martyn raised four children with his wife Esther Servoss Taylor, living in west Philadelphia for 65 years. Their oldest son, Henry Taylor Dechert (1859-1915), entered the University of Pennsylvania in 1875 as a freshman, and received his A.B. in 1879 followed by his L.L.B. in 1881. After graduation he began his legal career eventually founding the law firm Potter, Dechert, and Norris. Military service was also a part of Henry Taylor’s life, first serving with the First Troop, Philadelphia City Cavalry in 1884. 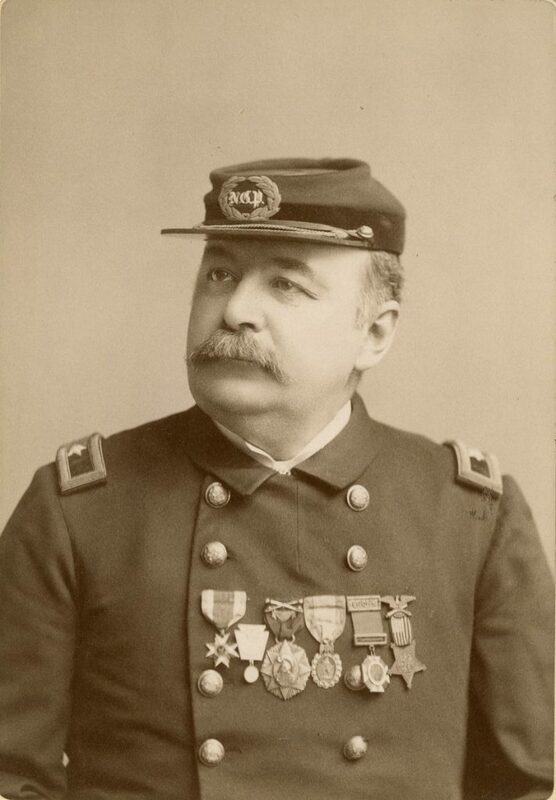 He later rose to the rank of lieutenant colonel in the Second Regiment Pennsylvania National Guard, serving with the unit during the Homestead riots, coal region strikes, and the Spanish-American War. Following the Regiment’s return to state service, Henry Taylor was elected colonel, and served 20 years until retiring in 1904. He would also start a family with his wife Virginia Louise, raising two sons. Robert Dechert (1895-1975), the oldest son, was born and raised in Philadelphia. After graduating from the Lawrenceville School, he attended the University of Pennsylvania from 1912-1916 where he was active in sports and clubs. Like his father, Robert entered the University’s Law School after receiving his A.B. in 1916. However, his legal studies were interrupted by military service in World War I. Robert reported to R.O.T.C. at Fort Niagara, New York in 1917 and was commissioned a Second Lieutenant. The following year he was deployed to Europe with the Seventh U.S. Infantry, Third Division where he saw action in five engagements and was awarded the Distinguished Service Cross for Gallantry in action at Le Charmel, France. Robert rose to the rank of captain, served in the Army of Occupation following the armistice, and attended St. John’s College, Oxford, England as a U. S. Army Student. 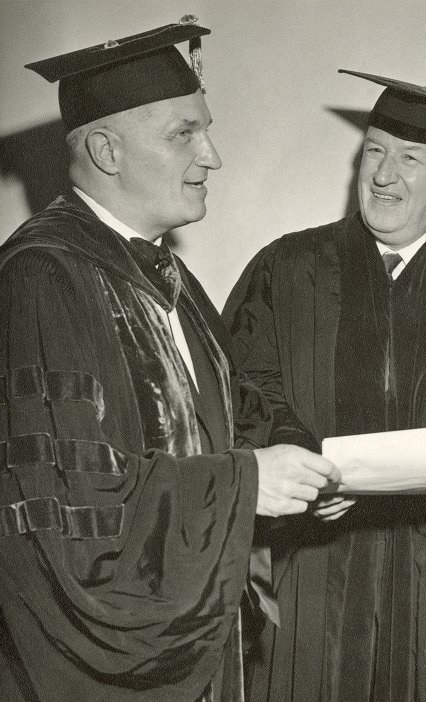 After resigning his officer’s commission, Robert returned to the University of Pennsylvania Law School receiving his L.L.B. in 1921. He started his law career in the firm of Hepburn, Dechert and Norris before moving to Penn Mutual Life Insurance Company where he served as Vice President and Counsel from 1927-1930. Along with William Curtis Bok he formed the law partnership of Dechert and Bok in 1930, which later became the firm of Barnes, Dechert, Price, Smith, and Clark. Robert became involved with politics in 1934 when he worked for Robert Schnader’s gubernatorial campaign. From 1957-1959 he served as General Counsel to the Department of Defense under President Dwight David Eisenhower. His association with the University continued through his life serving as a Trustee, and teaching at the Law School. Dechert was also active in civic organizations where he served on numerous boards, most notably the United Service Organization and the YMCA. The Robert Dechert Family Papers primarily documents the life of Robert Dechert, touching upon almost all of his activities. While there is little material regarding his law firms, the collection does document his education, military service, civic and political activities, and service at the Department of Defense. It includes correspondence, speeches, photographs, and maps along with biographical information. The collection also includes photographs and a letterpress copybook, 1901-1904 from Henry Taylor Dechert; biographical information on Henry Martyn Dechert as well as the minute book for the West Philadelphia Home Guard, 1861-1862 which gives a narrative of a local march and encampment; Robert Porter Dechert’s diary kept during the Carolina Campaign in 1865, his commissions, photographs, and scrapbooks; a law book belonging to Elijah Dechert, and a small group of papers from Andrew Porter, 1798-1806. Penn Mutual Life Insurance Co..
Phillips Brooks School (Philadelphia, Pa.). St. John’s College (University of Oxford). University of Pennsylvania. General Alumni Society. Award of Merit. University of Pennsylvania. Robert Dechert Collection of Americana. West Philadelphia Home Guard (Pa.). Course Notebooks Physics and English, n.d.
Dwight David Eisenhower – autographed, n.d.